At last week’s NAFSA annual conference in Los Angeles, the Institute for International Education (IIE) released the 2016 data on student mobility trends for intensive English programs. At the NAFSA session on Tuesday held by EnglishUSA, IIE, and the US Commercial Service, several important points were made about this data. Here is a recap of some of these points, as well as some thoughts about them. 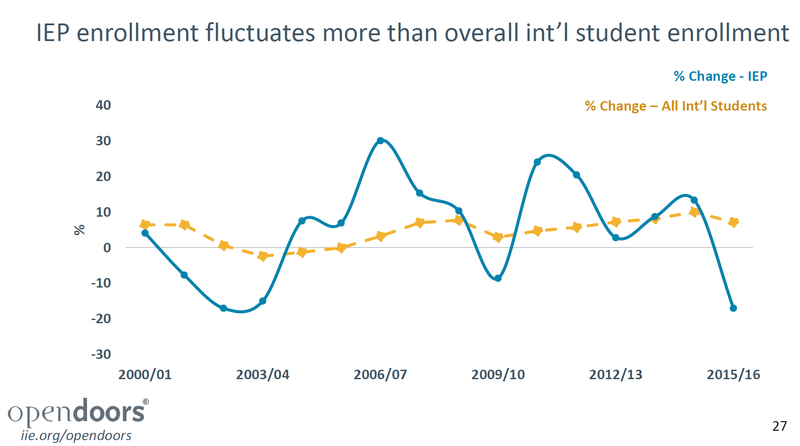 This can be seen in the following slide that was shown in the NAFSA session, which demonstrates the percentage change in IEP enrollment year-on-year compared to that of international students, overall. Source: Baer, Julie. “Open Doors Intensive English Programs.” Institute for International Education. Presentation at NAFSA annual conference, 5/30/2017, Los Angeles, CA. http://www.iie.org. This is a phenomenon that many IEP administrators noticed most recently during the “Great Recession” of 2009/10. At the time, programs at highly-ranked institutions that offered conditional admission to university programs were able to sustain (or even grow) their overall enrollment, whereas many schools that did not offer this type of program struggled during that time. Based on the feedback we received from students and agents during that period, we understood that, in times of economic or political uncertainty, potential students and their families are much more likely to postpone their study plans for general or cultural English courses than they are for academic English and university preparation programs. This is because they were unwilling to delay the students’ matriculation into full-time university study. By contrast, a person who is planning to study in the USA for a short-term English program may be more likely to delay their studies until conditions improve (e.g., more advantageous exchange rates). If this assumption holds true, then it would at least partially explain the volatility in IEP enrollment numbers vs that of overall international student numbers. In 2016, the number of IEP students in the USA dropped by 18.7%, and the duration of their stay (as measured by weeks) decreased by 23.2%. 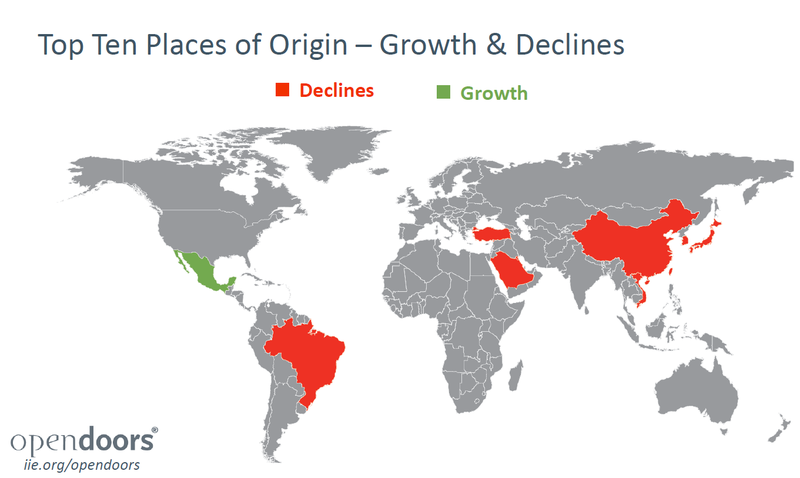 The biggest decreases were in the MENA region (-43%) and in Latin America and the Caribbean (-24%). This likely reflects the major changes in the main Saudi Arabian scholarship program and the freeze (and eventual cancellation) of the Brazilian Scientific Mobility Program. In addition, there were overall declines in 9 out of 10 of the top IEP markets (with the exception being Mexico — likely due to the Proyecta 100,000 program). In 2016, Saudi Arabian enrollment in IEPs dropped by 45% compared to 2015; the duration (measured in weeks) dropped by nearly 50%. Saudi Arabia had previously been the top sender of IEP students; now, it is the second largest sender (20,862 students in 2016), slipping below China (21,169). This is a major issue for IEPs. Not only is it riskier, financially, to be so dependent on so few markets, but it often has a negative impact on our students’ experience in our programs and can affect recruitment and retention. It also presents a major challenge to our finite resources for recruitment; we cannot be everywhere at once. The students coming to IEPs for the longest duration (averaging 20.6 weeks) are those from countries in Sub-Saharan Africa. Mexico’s population of IEP students in the USA increased by 39.5% in 2016, and their study duration (measured in weeks) increased by over 28%. There was strong growth in the number of students from Switzerland and Germany, though their overall numbers are relatively low in comparison to the top 10 sending countries. Admittedly, recruiting in these markets are not without its challenges (e.g., program pricing, limited scholarship funds, increased competition from markets like Canada, visa challenges, etc.). In the coming months, I suspect that many IEPs (my own included!) will be reconsidering their recruitment plan for the coming years. We will all be looking for ways to stretch our marketing dollars in order to attract students from underrepresented markets. Even so, if all things remain the same, it is likely that we will be living with the risk of over-dependence on 1-2 markets for quite some time.